The way we feel can be a choice; choosing to see positivity instead of focussing on worries and concerns all the time is a continual practice, and we can enhance this practice by choosing the types of foods which naturally boost happiness levels. A handful of cashews contains the same ability to boost our mood as a prescription dose of Prozac, while the healthy fats in coconut promotes healthy cell communication, aiding in maintaining high mood levels. Vanilla extract helps to calm the nervous system, while cinnamon is a brilliant blood-sugar balancer (a crash in blood sugar levels often leads to mood swings and hunger pangs). The fact that all of these ingredients are whole and nutritious means they promote a healthy body and a healthy mind, so dig out your ingredients, get cooking, and be generous with them once they’re ready! Melt the coconut oil in a pan over a very low heat, and pour into the mixing bowl once melted. Mix everything again until all ingredients are coated. Scoop out a tablespoon of mixture and hand-roll into balls (it’s ok if they seem like they’re not ‘sticking together’ very well, as the mixture will come together as it cooks, and you can make the granola bites a little firmer once they’re out of the oven). Place each ball on the baking paper and bake for 15-20 minutes, or until the cashews start to brown (continue to check on them after 15 minutes). If you have an oven with a fan setting, then use this – I’ve recently discovered that it’s a brilliant setting and actually cooks food within the right timeframe…. When they seem ready, take the baking tray out of the oven and scoop the granola bites into small muffin cases. Press the balls more firmly together while they’re warm if they seem a little crumbly. While cooking them I was considering calling these granola-crumble bites because they didn’t seem to be holding together, but once they’d cooled and dried, they turned out perfectly granola-y! Leave out to cool for a few hours or over night if you can trust that none are going to go ‘missing’. Store in the fridge or in a cool, dry place for up to a week. 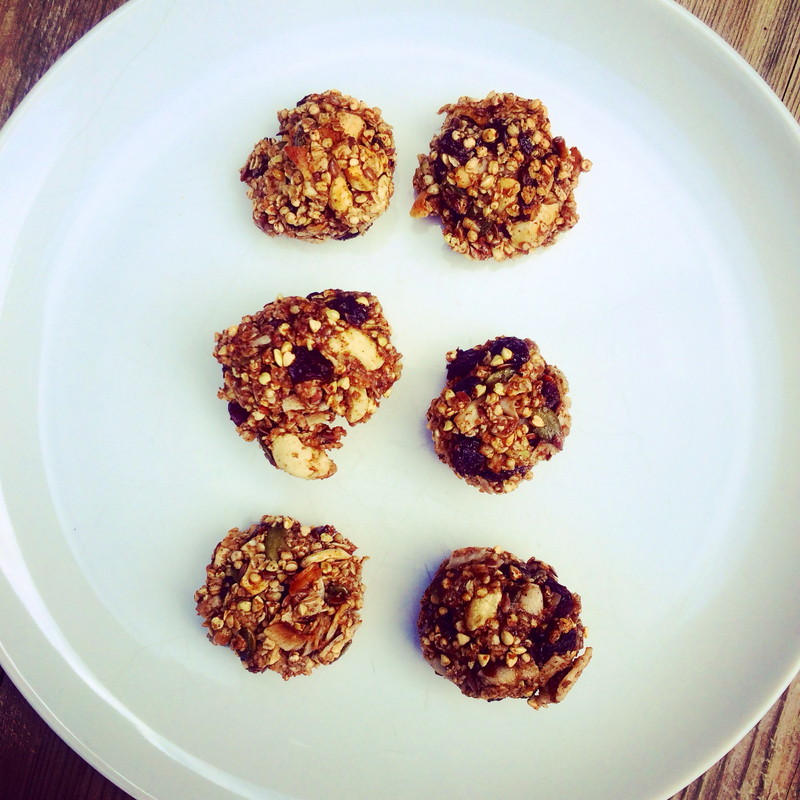 These are perfect as a mid-morning snack with tea, or as a pre or post-exercise energy booster. It might not always seem like it, but: In each moment of each day, we have the opportunity to CHOOSE health and happiness, and to watch as our choices effect not only ourselves, but the world around us too….